Tina (Wiebe) Harms was born on July 29, 1934 in Cuauhtémoc, Chihuahua, Mexico. She was named Katarina, the same name as her Mother, but both were always known as Tina. In 1938, when Tina was four years old, the Wiebe family moved from Mexico to Canada with their 4 small girls, the oldest being 6 and the youngest only 2 months old. There was great fear of the desperados who burned villages and killed people, so for their safety, the move to Canada was made. The Wiebe family settled in Blumenort, where they farmed in grain and beets. Six more children joined the family, they were now a family of 6 girls and 4 boys, with Tina being the second oldest. She attended the South Park School in their village until grade 8 and then she had to help at home. Tina accepted Christ as her Savior at a young age and was baptized as a teenager in the Old Colony Mennonite Church in Rosetown, MB at the age of 19. Faith was important to Tina her entire life. Her Bible is filled with underlined verses and notes in the margins. In 1954 the Wiebes moved to Mather. They farmed again and became involved in the church, with Tina attending youth and singing in the choir. This is where Tina met a handsome young man, Henry Harms, and they both knew almost from the beginning that they would be married. Henry and Tina were married on June 22, 1957 in the Crystal City United Church and settled on the Harms family farm at Snowflake. Life was filled with chores, gardens, keeping the yard immaculate, the home clean and meals on the table. Five children joined the family: Lorna in 1959, Joanne in 1964, Ken in 1967, Nancy in 1970 and Andrea in 1976. The value of hard work was passed onto the children as they also helped with chores and housekeeping, gardening and harvest. Tina became a Canadian citizen in 1981. She studied hard, took the tests and went to Winnipeg for the official ceremony. She was welcomed as a citizen into the country, even though she’d been here almost her entire life. Henry and Tina were always very active in the community. They both loved to curl and they helped at community events. Tina would make food and serve at curling bonspiels, hockey tournaments and potlucks. The Harms family attended the Crystal City Mennonite Church. Tina was a prayer warrior, always praying for her family and people who had struggles. She was involved with the Ladies Aid, helping with quilting and other projects. Henry and Tina moved to an acreage just outside of Crystal City in 1991. Tina always had a love of flower gardening and she wasted no time filling their new yard with a large variety of flowers, especially lilies and irises. She loved to watch the birds, so there were always a lot of bird feeders and bird baths in the yard. They also had more time to read now and they did a lot of that. Their next move was to the duplex on Rupert Street in Crystal City in 2010. Again, a couple flower beds were planted, but other than that and keeping those bird feeders filled, they didn’t have a lot of other responsibilities, so they could continue to enjoy the flowers, watching the birds, reading, and visiting with friends. At this time, Henry & Tina were attending Cornerstone Church, they were faithful attendees, Tina continued to pray for others and she probably read every book in the library. She showed love to others with her baking. Family favorites are her buns, pinwheel cookies and jam jam cookies, orange fluff jello and chocolate zucchini cake. She would often make buns and soup and take to a family who needed it, or she’d leave it in someone’s car in town for them to find after work. When the grandkids had birthdays, she’d bake them a cake or a lemon pie and take it to them. She was always baking and giving to others, knowing what your favorites are and making sure she had those on hand. Tina had her share of health issues, including breast cancer which she conquered, and she was hospitalized at Rock Lake Hospital for most of December 2018. On January 17, 2019, both Henry and Tina were able to move together into Prairie View Lodge in Pilot Mound. The staff took great care of Tina in her short time there. 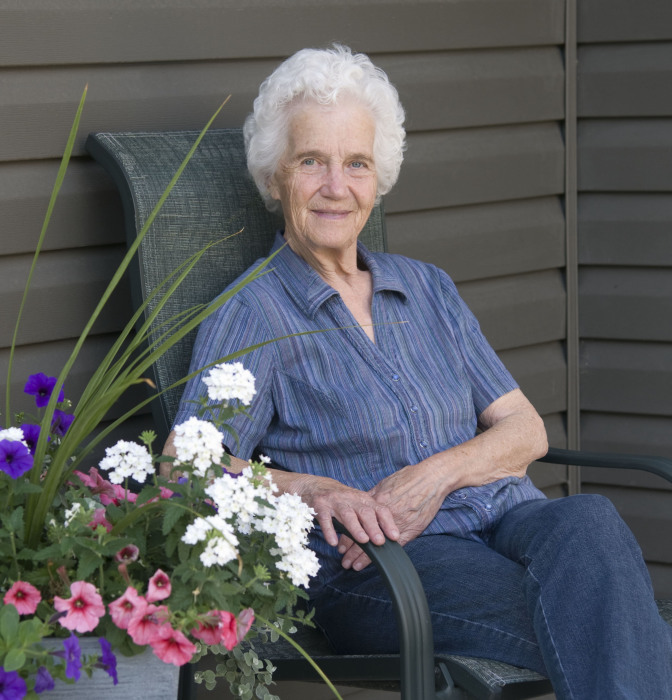 Tina passed away on Friday, February 8 at the Prairie View Lodge in Pilot Mound, with family at her side. Tina is predeceased by her parents, Frank W. & Katarina Wiebe, her mother’s second husband Abe Sawatzky, two sisters and one brother, her oldest daughter Lorna and many extended family members from both her and Henry’s families, and friends. She is survived by her loving husband of 61 ½ years, Henry; son-in-law Terry; daughter Joanne and husband Allan; son Ken and wife Alice; daughter Nancy and husband Doug; daughter Andrea and husband Paul; 16 grandchildren, 6 spouses of the grandchildren; 4 great grandchildren; 3 sisters and 3 brothers, many in-laws and dear friends.